and simplifies the installation tasks on the electrical equipment. The transmitter is electrically compensated in accordance with the non-linear behaviour of SF₆ gas according to the virial equation. This achieves the highest accuracy for the gas density. The transmitter records the pressure and temperature of the SF₆ gas in the gas tank. 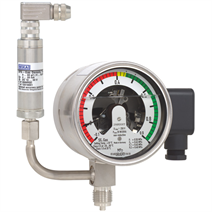 The current gas density is ascertained from both measurement parameters by means of an electronic evaluation system. Thermally induced pressure changes are dynamically compensated and do not affect the output signal. The transmitter generates a densityproportional, standardised signal of 4 ... 20 mA. Recalibration of the zero point is not necessary due to the high long-term stability of the transmitter. The measuring cell ensures a high long-term sealing and is hermetically sealed to prevent leaks and remain independent of atmospheric pressure fluctuations and variations in the mounting height.